Osiris’s approach to life includes a practice that encourages a personal connection to nature that is honoring and sustainably conscious. For Osiris, this practice has led to an understanding that out of our mutual healing with nature, we can find insights for renewing life within the community. She first experienced this potential growing up on her family’s ranch in Panama’s Pacific Central Provinces, where her interest in the interplay of farming and culture grew in these formative years and eventually led her to the study of Biodynamic Agriculture. 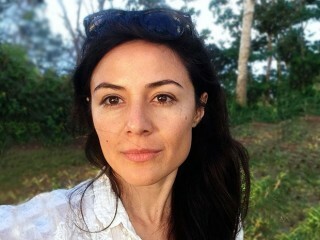 In exploring the diverse social contexts within the Biodynamic movement, she became involved in the certification process and since 2008, Osiris has been engaged in the evaluation of crops and food production for Demeter USA, organic and social responsibility programs such as Fair Trade, FT Capture Fisheries, and the Equitable Food Initiative. Working with these organizations has provided Osiris with the opportunity to connect to distinct communities in such places as: farms growing medicinal herbs in Mexico, grape growers in California, fresh produce growers in Canada, fruit orchards and cacao in the Caribbean, tropical spice farms in Central America, and fishing associations in Maine and Iceland. As her work and travel unfold, Osiris stays attentive to the evolving dialog on how sustainability is collectively re-defined. She maintains reverence for natural rhythms and finds ways to integrate movement arts as an aerialist, acrobat, and in her renewed relationship with surfing. Osiris is inspired by the potential of the cross-pollination of her work evaluating regenerative farming practices and social responsibility with the STOKE Certified vision. Osiris sees it as a continuation of her journey to support the moral task we have to care holistically for the natural environment and the health of community life.